Based on Shakespeare’s The Winter’s Tale, a musical for young people, was commissioned by The Sage Gateshead in 2005. The première performances took place on December 7th-11th 2005 at The Sage Gateshead, Directed by Nick Stimson with Sharon Durant as the Musical Director. The musical was also chosen as the touring production for the YMT:UK in 2009-10. The professional première of the work at the Landor Theatre in London took place on 7th November 2012 followed by a run of 24 performances through to the end of the month. Reviews of the production are available here. In January, it was announced that the production had won the Off West End Theatre Award for Best New Musical. See the news story about this award here. Howard Goodall wrote some notes about composing this musical which can be found here. 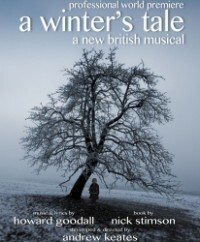 Mountview Academy produced A Winter’s Tale in June 2014, directed by Matt Ryan.